Austin's Hey Cupcake has filed a federal lawsuit that accuses a trailer cupcake business in Indiana of copying the appearance of its retail trailers. 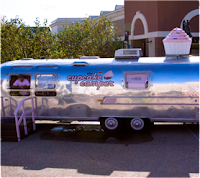 The lawsuit, filed Wednesday in U.S. District Court in Austin, said that the Cupcake Camper in Noblesville, Ind., operates out of an Airstream trailer with a large, three-dimensional cupcake with pink frosting on the roof — similar to trailers used by Hey Cupcake. Hey Cupcake owner Wes Hurt's lawyer Robert Kleinman said that it just seems "beyond coincidence" that the look and feel of the Indiana trailer business, which opened last year, is so similar to Hey Cupcake, which has been operating in Austin since 2007. He said that Hurt hopes to expand his company nationally and internationally and that customers may mistakenly think that the Cupcake Camper is somehow related to Hey Cupcake.